CozyPhones is the next generation of Headphones and are designed especially for those who have problems with regular earphones such as not fitting their ears, falling out or being uncomfortable. We go through earphones like crazy here. We’ve tried headphones but they are big and clunky so we switched to earphones which you can buy for cheaper. But the kids have been going through them like crazy AND they are constantly falling out of my children’s ears too. While they fit my ears, the vibrations of the sound makes my ears itchy so I constantly have to take them out to scratch the inside of my ears with my pinkie or a Q-tip. There are many ways in which CozyPhones are different from regular head or ear phones. 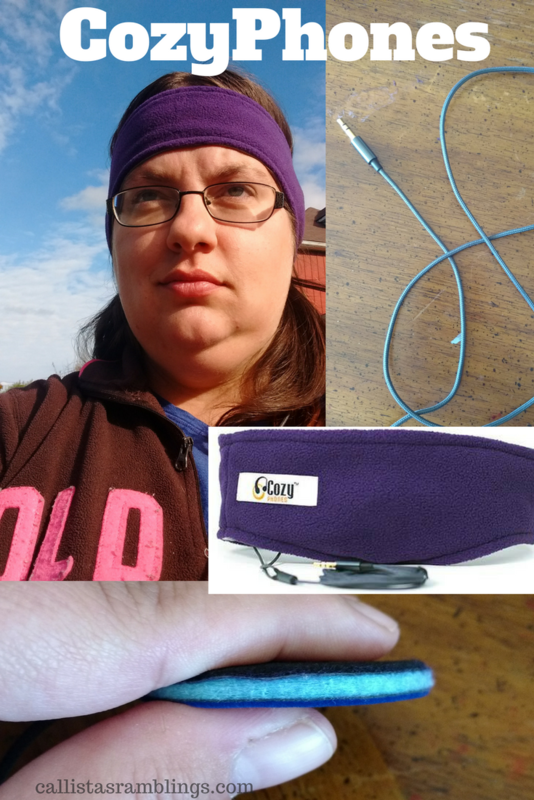 CozyPhones go around your head but in a comfortable fleece cloth band that hugs your head and doesn’t easily fall out. The speaker part is a flat circle that is completely adjustable within the band so that no matter where your ears are on your head, the speakers will fit in exactly the right spot. The cord is not the usual plastic/rubber cord that you get on head or ear phones which breaks easily, especially if bent. CozyPhones comes with a braided type cord that can bend any which way and not break. The part you plug in is also better able to handle a bit of roughness. CozyPhones are best for when you want to listen to music or a podcast while going to sleep or while relaxing on the couch or bed. Why? The comfortable design means that you can lay back and listen without worrying about them falling off or out or hurting because you are on your side. CozyPhones also had a special design for those who exercise while listening such as running or jogging. This design is made out of Lycra instead of Fleece which helps wick away sweat. Oh did I mention they are WASHABLE? All you do is slip the speakers out of the headband and throw it in the wash. Dry flat and then add your speakers back in to the right place and you’re good to go. I received a pair of my own to try out in fleece. Although in general I don’t like hats or headbands I still love them. The wrapping around my head thing bugs me a little but I’m getting used to it and I love that it keeps my ears warm during the cold weather while I can listen to music. When the popularity of CozyPhones grew, the creator added bands for kids with cute characters on them and volume limits to stop children from hurting their ear drums. They have many different designs including PAW PATROL! You can purchase your own pair at the Cozy Phones website.